Over the past two decades, obesity has rapidly spread through the pet population, causing a host of serious illnesses, and resulting in diminished quality of life and premature death. 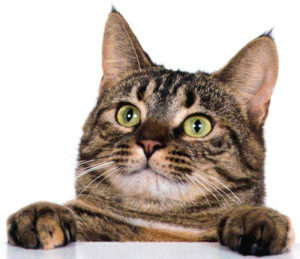 It is estimated that 56% of dogs and 60% of cats in the US are either overweight or obese. Shockingly, 21% of dogs are overweight by the age of six months. As in humans, obesity predisposes our pets to life-threatening illnesses, including kidney disease, hypertension, diabetes, cancers, cardiovascular disease, respiratory disease, urinary disease, and debilitating arthritis. Many pet owners have difficulty recognizing that their cat or dog is overweight, confusing excess body fat with a “stocky build” or “heavy bone structure.” Your veterinarian can accurately determine your pet’s ideal weight and then design a specific weight loss plan. In addition, your vet can provide support throughout the process by making dietary adjustments and formulating a progressive exercise program. As in humans, weight loss in animals depends on creating a negative energy balance by burning more calories than are consumed. This is achieved through diet and exercise. Veterinarian recommended food, like the kinds we offer at the Animal Clinic of Billings, help keep pets thin and healthy. A weight loss diet must be carefully balanced to ensure that adequate amounts of protein, vitamins, and minerals are present, while carbohydrates and fat are sufficiently limited. Specially formulated prescription diets are available that incorporate elevated levels of protein and fiber to maintain lean muscle mass and keep pets from feeling hungry, while limiting their intake of carbohydrates and fats. Feeding trials have demonstrated that, when fed in the correct amounts, these special diets are very successful in achieving significant weight loss. Of course, a certain amount of tough love is required to adhere strictly to these diets, but the effort is worth it – resulting in a healthier and happier pet. Exercise is an important but often challenging component of weight loss, not only because of the significant amount of time involved to provide a pet with regular exercise, but also because many overweight pets have orthopedic pain resulting from their excess weight. 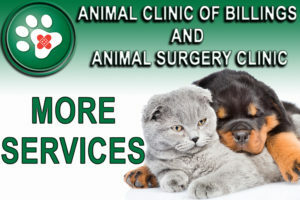 A veterinary physical rehabilitation facility, such as the one at the Animal Clinic of Billings, can provide invaluable assistance. In an underwater treadmill pets receive a custom-tailored workout that addresses their specific needs without experiencing discomfort. Other physical rehabilitation modalities, such as low-level laser therapy, heat, and massage, are often incorporated to further enhance comfort and reduce inflammation following each workout. If you are concerned your pet might be overweight or obese, or would like to learn more about our diet and weight loss strategies for cats and dogs, our team of veterinarians and support staff is here to help. Call us to schedule a consultation with one of our veterinarians today to get your cat or dog on the road to a healthier, fuller, and longer life.